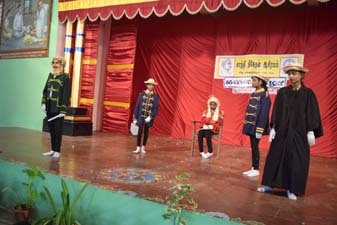 In connection with the 106th Birth day Celebration of our founder of Gandhi Niketan Ashram Amarar G.Venkatachalapathy and 75th Annual Day Celebrations of the Gandhi Niketan Ashram, Inter school competitions in various activities among the Higher Secondary and High School Students belonging to Usilampatti Educational District were held. 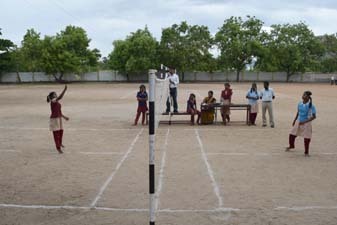 The third day competitions were conducted as Village Heritage Sports on 15th July 2015. 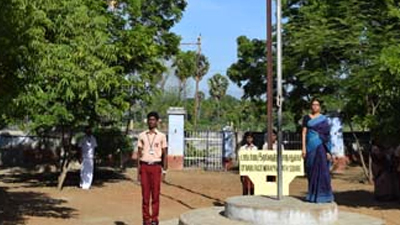 In the presence of our Headmaster and teachers, Ashram Secretary Mrs.V.Radha, Madurai Chief Educational Officer Mr.Angelo Irudayasami declared open the competitions. 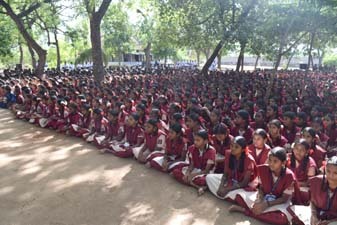 More than 10 schools from Usilampatti Educational district participated. 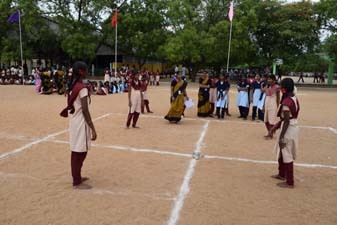 Thattangal, kilthattu, Nondi, Tennikoit, Co-Co were the games played by the female students. 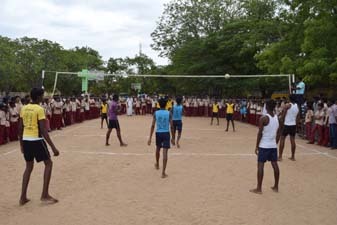 Kabbadi, Pambaram, Kitti, Basket Ball and Volley Ball were played by the male students. 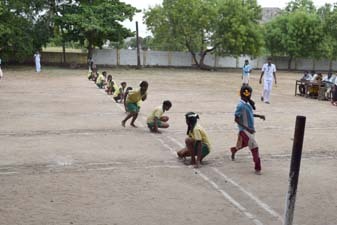 The boys and girls took part with enthusiasm in the more or less forgotten Competitions. 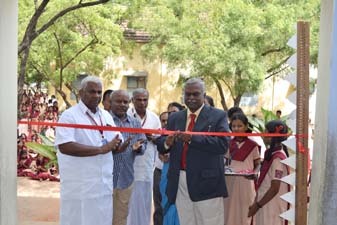 Dr.Jeyachandran CECRI Karaikudi and Dr.Maruthamuthu declared opened the exhibition. 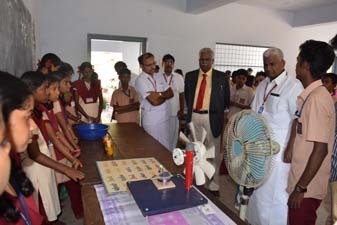 Dr.Jeyachandran emphasized that students should have interest in doing researches in all subjects. The experts can create any thing meaningful. 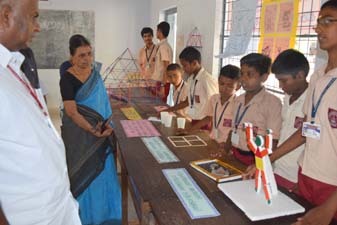 Many schools participated in Science Exhibition. 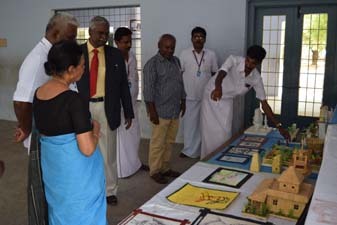 Our Ashram Secretary and our Headmaster selected the best project from other school. 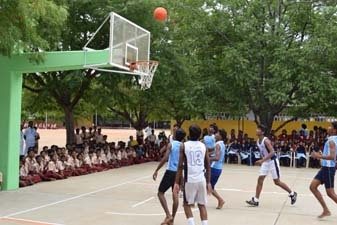 Govt High School – Gopinayakkanpatti. 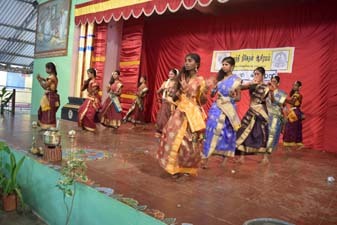 As a part of our Anniversary We Celebrated the cultural festival on 24.07.2015 and 25.07.2015 in our school auditorium. 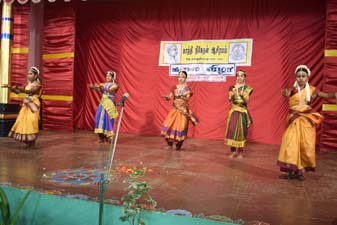 The Cultural Programme was started with the prayer. 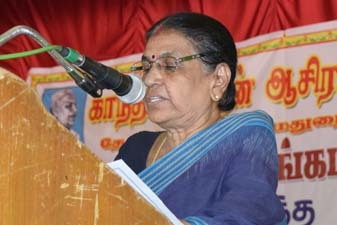 Our Ashram Secretary Mrs.V.Radha welcomed the gatherings. 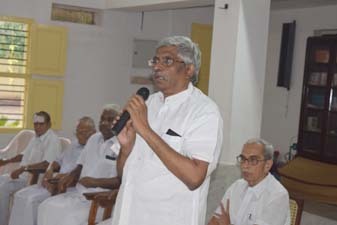 Our President Prof.R.Venkataswami inaugurated the function through Skype. 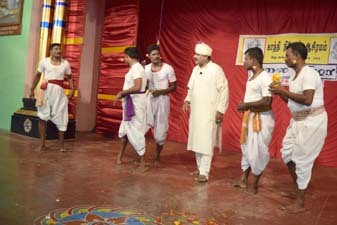 In his talk he told that students should develop their individual talents. 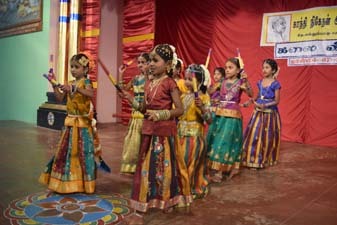 It will help them to shine in future life. 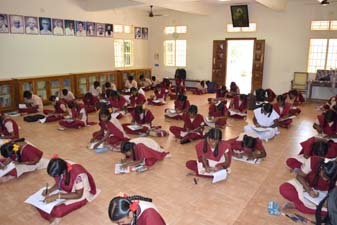 Identifying those kinds of students is not only the duty of the teachers but also the duty of the parents. 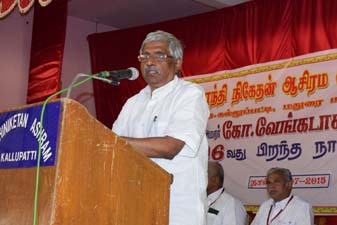 Then Dr.V.Ragupathi Governing Body Member of the Ashram gave inaugural speech. 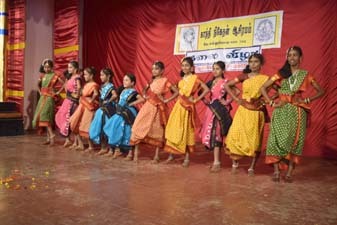 In the function all the students, teachers and parents were also present. 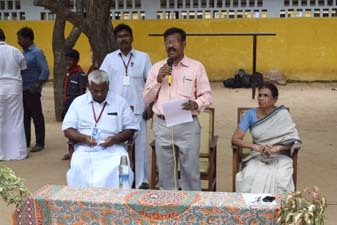 Our Headmaster Mr.G.Muthuramalingam welcomed all. 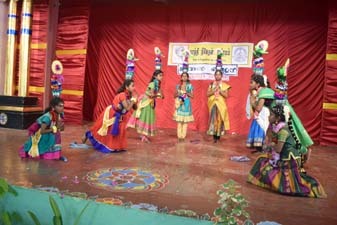 The students of our Primary School gave the following cultural items.Baratham, Fancy dress, Mahabaratham drama, Group Dance and Aerobics. 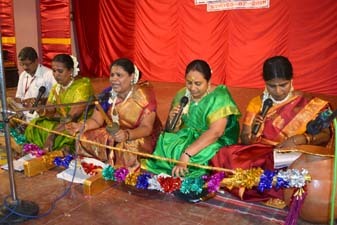 Mrs.Vijayarani and Mrs.Uma Maheswari sang a song jointly. 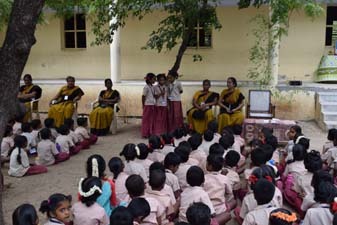 Mrs.Parimala, Headmistress Gandhiniketan G.V.Primary school gave vote of thanks. 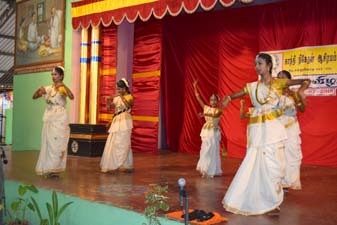 After the break the programmes of our Higher Secondary School began. 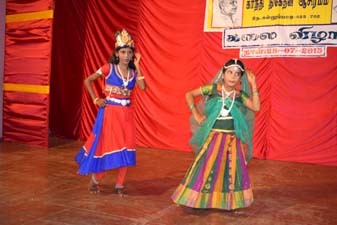 Bharatham, Kolattam, Kummi, Kerala Dance, Aerobics, Kavadiattam, Karaham, Mimeshow, Tamil Drama and English Drama were performed. 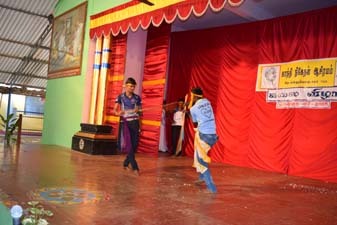 Teachers drama and Villupattu were also performed. 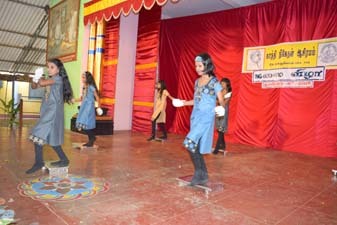 A large number of parents and all the students appreciated and enjoyed the programmes. 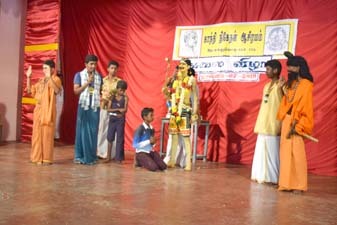 The 106th Birthday of our Ashram Founder Amarar G.Venkatachalapathy Ayya and 75th Annual Day Diamond Jubilee of our Ashram were Celebrated on 31st July 2015. 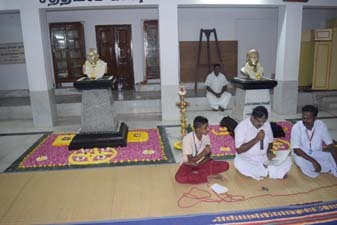 At 6.00 A.M Special Prayer was conducted at Gandhi Mandapam. 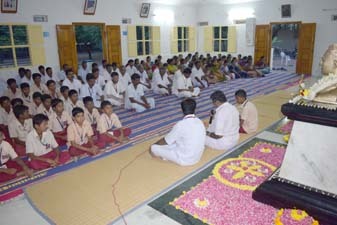 In the prayer meeting Prof. R.Venkataswami President, Gandhi Niketan Ashram, Mrs.V.Radha, Secretary Gandhi Niketan Ashram, Governing Body Members and Chief Guests of Gandhi Niketan Ashram, Hostel Students, Teachers of both Gandhi Niketan Primary and Higher Secondary School, Central Office Staff Members also participated. 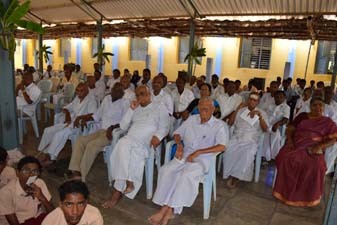 In the meeting Our Ashram President gave talk about our founder. 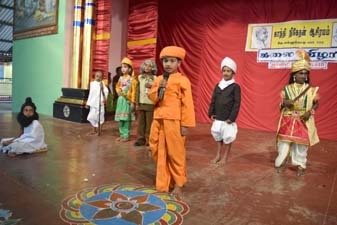 He told that our founder started our Ashram for the poor and needy people as per the wishes of Gandhiji. 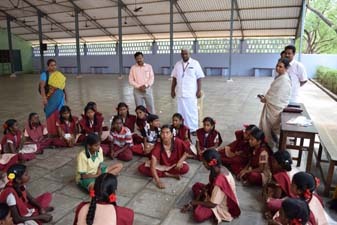 He also told that Gandhian Principles and Village Services should be fed in the minds of the students. Cleanliness is next to Godliness’. These are the golden words that is adapted by Gandhiji throughout his life. 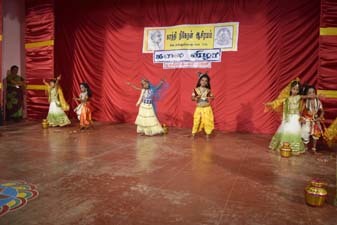 Thinking will help us to improve our Ashram society to go in better way. 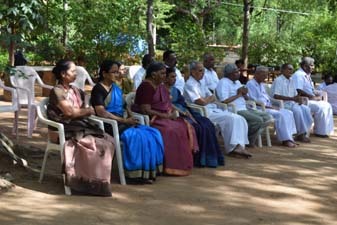 Our Ashram Governing Body Member Mr.V.Ragupathi talked about the importance of the Village Service which was followed by our founder. 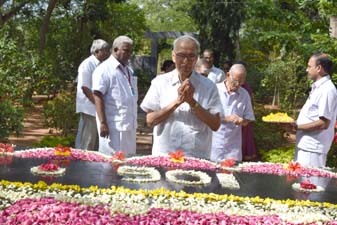 He remembered the arrival of the great leaders like Kamarajar, Kumarsamy Raja and Jawaharlal Nehru’s Aunt. Our Ashram is a Sacred place. 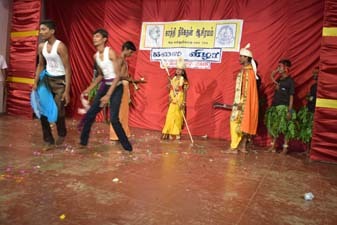 Innocent, Poverty and Untouchability must be healed from our Society. That is the dream of our founder. We all should remember his thoughts and we should follow in our life. That is the real tribute to him. 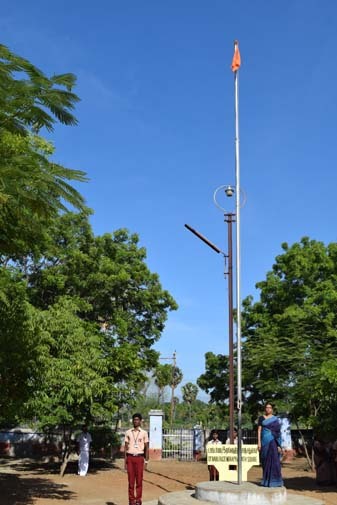 At 8.30 AM we all gathered at Dr.Rajendra Prasad Square for flag hoisting. 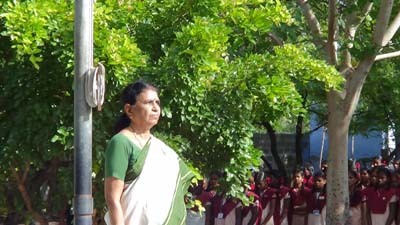 Mrs.V.Radha, Secretary, Gandhi Niketan Ashram hoisted the Ashram Flag. 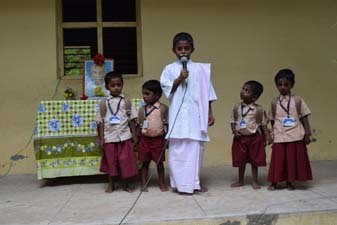 At 9.00 A.M We all went to Shanthi Vanam – Founder’s Samathi Bhajan was sung by our school teacher Ramani Sekar and group. 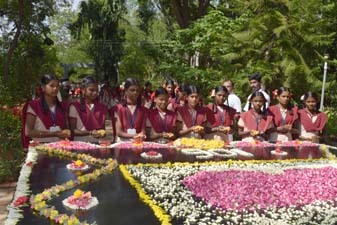 After that we paid a Floral Tribute at Founder’s Samadhi. 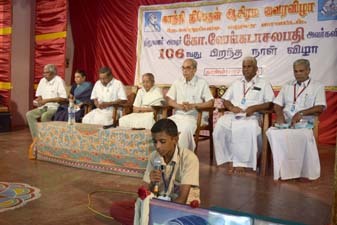 At 10.15 A.M the public meeting started at the auditorium with the prayer. 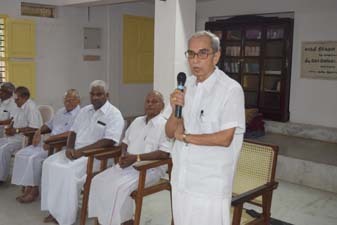 Our Chairman Prof R.Venkataswami welcomed the gatherings. 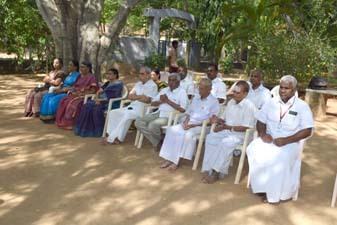 In his welcome Address he remembered the 16 leaders who all supported for the development of our Ashram. 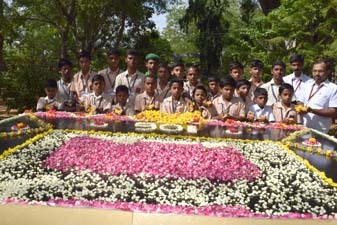 Because of all these leader’s Sacrifice We celebrate this memorable day as Diamond Jubilee today. 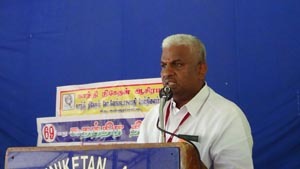 Read Felicitations by Mr.M.Nagarajan, H.O. 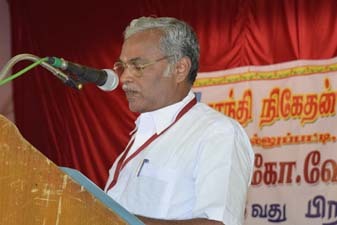 Mr.Nagarajan, Administrative officer of Gandhi Niketan Ashram read the felicitations received from Thiru. 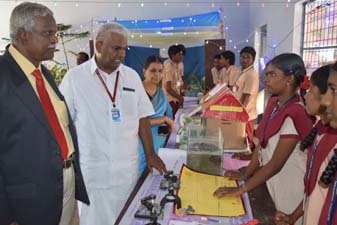 Ponnambala Adihalar, Mr.Venkatramanan Lakshmi Mills, Coimbatore, Dr.Jeyachandran, Chief Enginer, Karaikudi, Mr.Sridharan,Vice Chancellor, Kalasalingam University, Mrs. Valli Umayal Aachi, Arunachalam Trust, Chennai and Mr.Rajendra Cholan I.A.S (Old Student of our School). 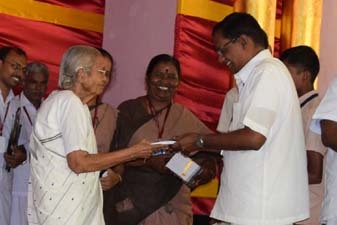 Our Ashram Secretary Mrs.V.Radha presented the Annual Report. 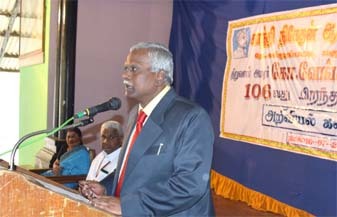 The Special Guest Mr.M.P.Gurusamy, Secretary, Gandhi Museum delivered the Founder’s Oration. 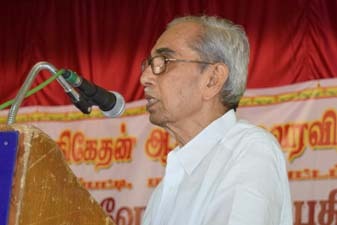 He shared his memories with our Founder G.Venkatachalapathy. 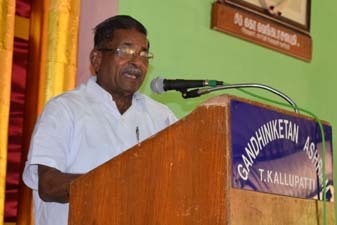 He emphasized the importance of Gandhism and J.C.Kumarappa’s principles. “Gandhism” is the only source that will help us to unite our nation. 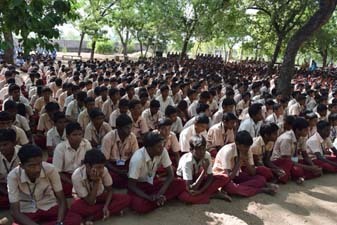 It will help us to change our generation. 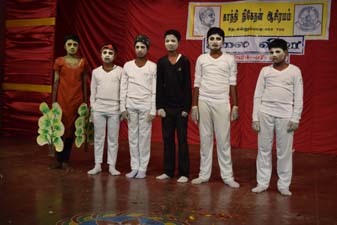 So, he asked the students to spread Gandhian Thoughts among the people. 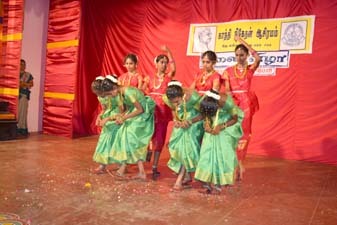 Kandu Kondan” that is Sarvodayam. 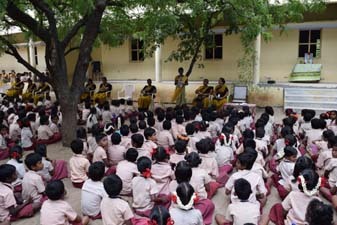 Basic Education is the only source to lead the world in progress. 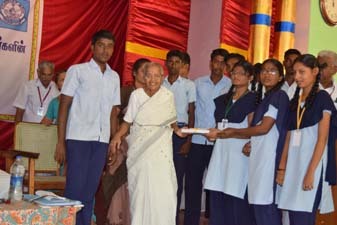 Dr.Kousalyadevi Amma, Life time Trustee, Gandhigram presided over the function and distributed the prizes to the students who scored high marks in the Govt Exams in X and XII std and the winners of all the various competitions conducted by our school. 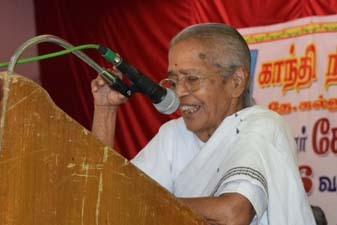 In her presidential address she talked about the importance of Social Service. All should adapt this noble quality. 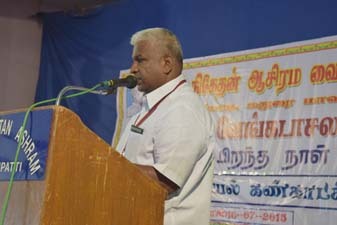 Dr.V.Ragupathi gave vote of thanks. The meeting came to an end with the National Anthem. 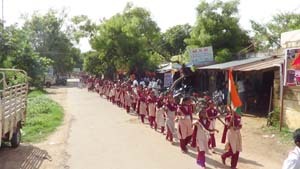 We Celebrated 69th Independence Day in our Ashram on 15.08.2015. 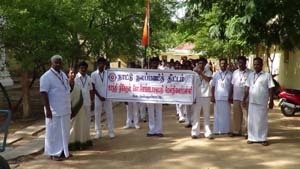 Our Ashram Secretary Mrs.V.Radha hoisted our National Flag at 8.30 A.M All the students went in the procession through main road. 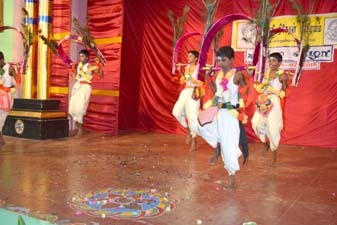 They raised the slogans like Vandemadharam, Mahatam Gandhiki Jay Jaihindh etc.